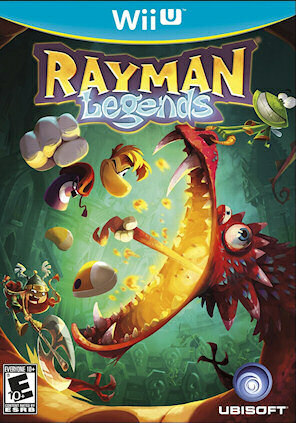 Keen and I picked up Rayman Legends a few days ago — it’s crazy fun! Usually Keen is pretty awful at console games but he is, surprisingly, not so bad at this. He’s actually getting better over time. Who knew? Anyhow… just dropping by to throw out some thoughts about the game. This game looks nuts. I don’t think too many games use the hand-drawn graphics style these days but it looks fantastic and runs totally smooth. We’re playing on the Wii U version, arguably the definitive version, and it looks great. I can’t imagine the visuals being any different on the other systems, though. The game isn’t quite as nice looking on gamepad-only play but it’s still good. It’s unfortunate that there’s no online multiplayer, though, ’cause I’d love to see how the game runs with 5 people playing at once. Running through levels together is a blast and looking for all the collectables is actually something we’re doing together. Usually Keen can’t be bothered to collect everything or doesn’t have an interest but there have been several instances where he says “Let’s replay that level I think I can get them all”. Playing co-op is great because usually I’ll be the first person to run off an edge or into a hazard in search of hidden stuff and I have the fortune of having the more cautious player to reel me back in. So far from what I can tell the game mechanics are the same. You run, jump, slide, etc. We haven’t unlocked any new abilities yet, if they even exist. Even so it’s an incredibly fun game and the levels are really well done. Especially if you love trying to speed through them. We actually really love the music-themed levels. As you run through, all of your actions (i.e. jumping, sliding, hitting) are timed to the music and beat. It’s really thrilling and we find ourselves humming the tunes even when we’re not playing. I really like the levels where one player runs through the course while the other needs to manipulate the environment on the gamepad to help them. Pull a lever to open a door, raise/lower/slide a platform, cut a rope, etc. These are the levels that will really test your friendship/relationship. I’ve been letting Keen do the platforming while I handle the switches and platform moving. Usually we’d do this kind of thing the other way around but, like I mentioned earlier, Keen is shockingly capable. Of course that doesn’t mean that you wont hear lots of yelling, insult, and swearing thrown back and forth but that’s just part of the experience, right? Or maybe we’re just incredibly dysfunctional. It’s funny because we tend to get retaliatory in these situations and in a situation where I need to clear the way I might instead ram him into spikes or cut the rope he is hanging from. What kind of little brother would I be if I didn’t, though? Still, when you actually start to get in sync and trust each other then things start to get really fun. He may jump over a huge ravine with no hesitation but he knows I’ll get the platform under him or release the rope… most of the time. This kind of asynchronous multiplayer is really appealing to me and one of the reasons I love the Wii U. It’s really neat how we’re working together but essentially doing different things. Being able to play splitscreen without actually having to split the screen is also a lovely feature. At least when the game supports it. I’m looking at you, Disney Infinity. The challenge missions are ones I’ve been mostly doing by myself when Keen is doing something else. They’re a pretty ingenious addition to the game. There are several categories of challenges and UBI will swap them out every so often. They are usually set in some continuous level and require you to do anything from getting as far as possible, collecting lums, beating the clock, etc. Your score is then put up with other players and you receive a rating. The better you do the better your rank bracket. When the challenge ends you get awarded Lums based on your grouping. What’s cool is you also get to see the ghosts of all the players who ranked close to you and race against them or see what they did better or worse than you. That’s pretty useful for picking up new strategies and improving your own score or time or whatever. The whole process is incredibly addicting, too. I was replaying the same challenge over and over and trying to claw my way up the ranks. When you are on the threshold between silver and gold or above you are driven to cross the threshold. You can be unseated, however, if the challenge goes on long enough and more people do better than you. Some challenges might only be 24 hours but the ones available for a week might require you to defend your spot more than once. The Content! There’s So Much! With all the levels, collectables, and challenge mode stuff there’s a whole lot to do. Oh, and for some reason they decided to include most of the levels from the original game just because…? Okay, that’s pretty awesome. We’re still working through the game, but I feel pretty safe in advising anybody with the means to pick it up. I can’t speak for the quality and controls of the Xbox and PS3 versions, especially the when you consider the levels with touch mechanics, but I imagine they’re still good. I also hear the Vita version is fantastic. Any way you decide to pick it up you really can’t go wrong. I almost picked this up, but snagged Diablo 3 instead. I’ll get this later after I’m done killing demons. Thanks for the write up. 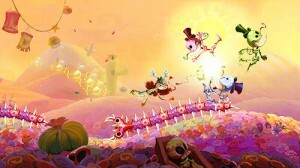 I love Rayman!